We are early! We are one week early this month. How come? Well, it’s Pride weekend the last weekend in MCR in August. And that’s a pretty big gay deal in this town. As such, we’re getting the hell out of the way in our little clown car. But, we’re still here and we’re still bringing you the good! Bilal Zafar–He’ll be laptop projecting his Twitter battle, Cakes, into the room for us. I’ve seen it. It’s hilarious. Two beautiful noobs in the middle. Beckie Fox is a recent grad of the ComedySportz MCR stand-up workshop. I’ve seen her work in progress. She’s got the goods. Callum Morris-Glue joins her. You might recognize him as your charming barman at Via. He’s been making the rounds on the circuit in Manchester and bringing the funny. We’re super pleased we can showcase his talents on his stomping grounds. Rachel Fairburn will be closing the gig this month. Half of the dreadfully funny All Killa No Filla podcast, Rachel is a brilliant act. A murderous porcelain doll of a woman. £2 in or FREE with student card. August 24th. 7:30 doors with a prompt 8PM start time. Downstairs at Via on Canal Street, MCR. 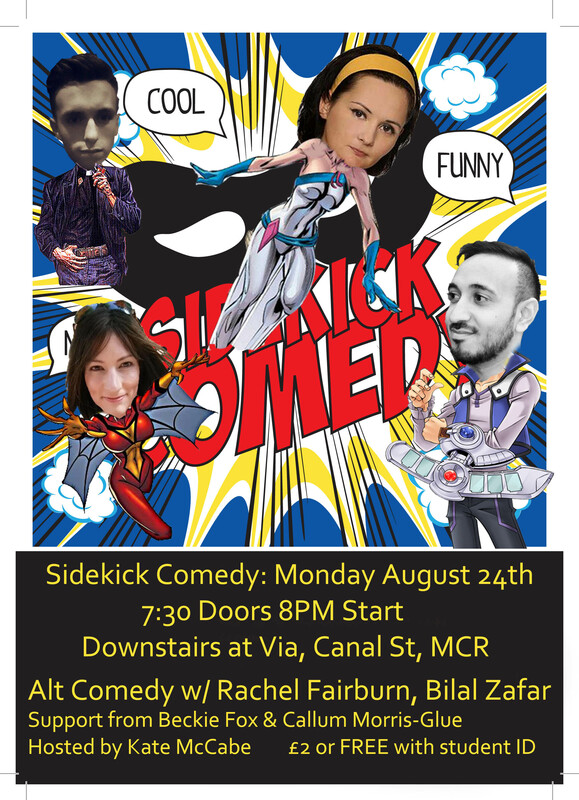 This entry was tagged Beckie Fox, Bilal Zafar, Callum Morris-Glue, Comedy, Manchester, Rachel Fairburn, Via Fossa. Bookmark the permalink.